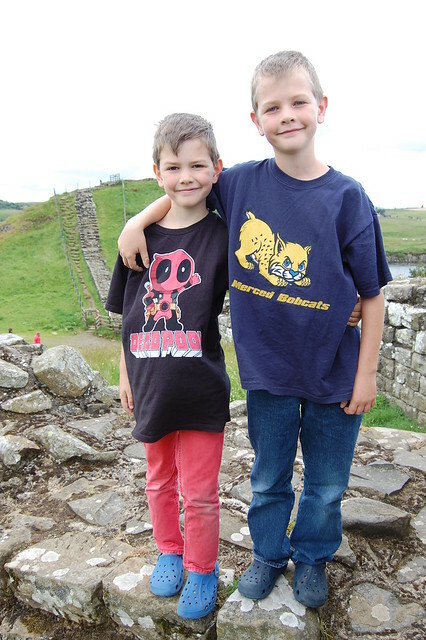 In order to break up the long car journey from Fife to Wiltshire, we decided to stop off on Hadrian’s Wall. 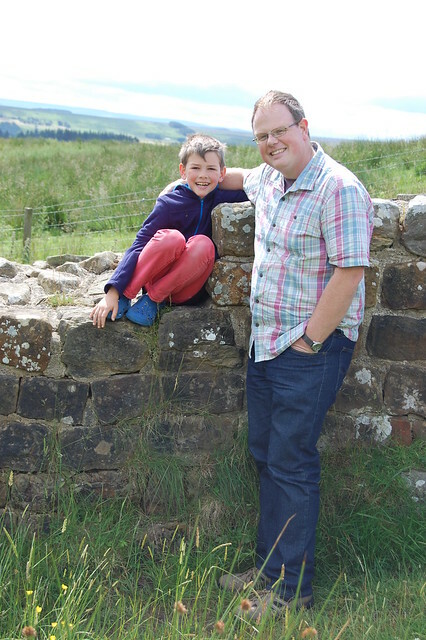 We had been to Hadrian’s Wall a few times before, including hiking stretches of it with a toddler and a baby in 2006, but we never tire of it – especially Mr Pict since he is a fanatical geek when it comes to ancient Rome. 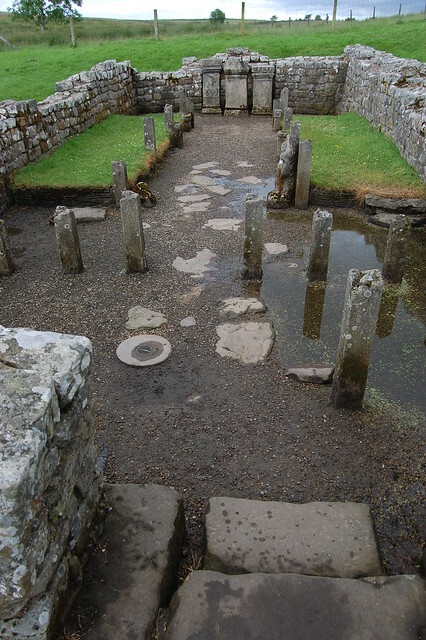 Our original plan had been to visit Vindolanda, an extensive fort with a fantastic museum. 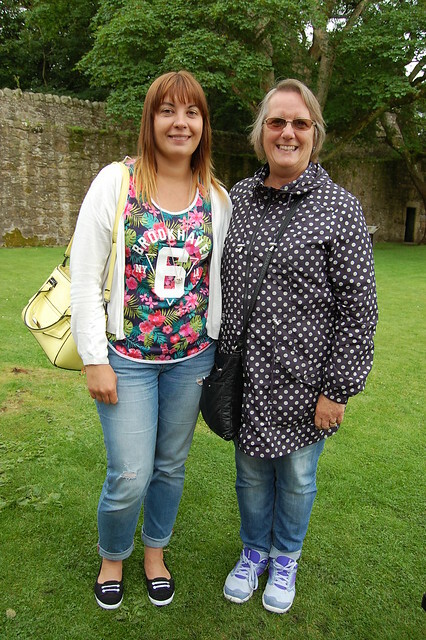 However, we made such terrible time on the first stretch of our journey that we decided not to commit too much time to a single site and to instead visit two or three sites along Hadrian’s Wall, ones that were free to access so that we didn’t feel we had to stay in any one spot for too long. 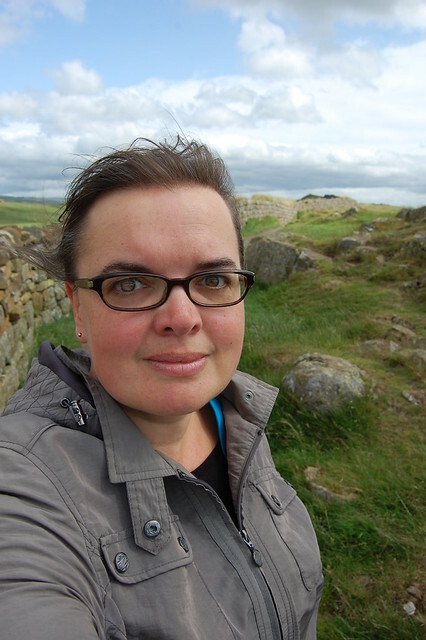 Hadrian’s Wall – a defensive barrier between Roman occupied England and Scotland, running wild with ferocious Picts like me – stretches the width of Northern England from the Solway Firth in the West to the Tyne in the East. 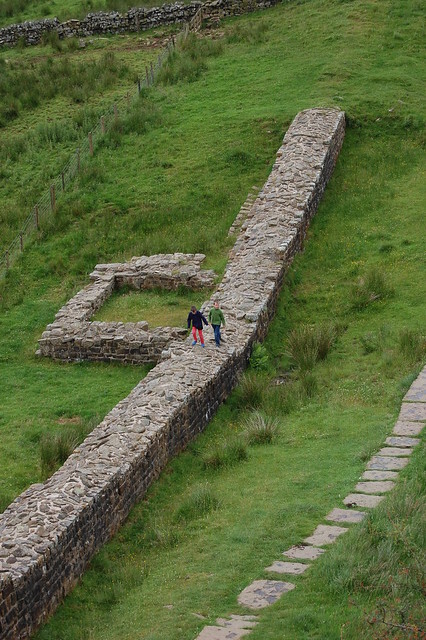 There were forts approximately every five miles and milecastles in between. 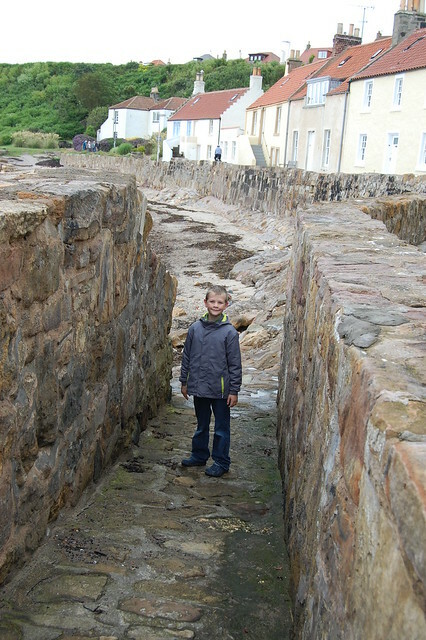 It was essentially the boundary marker for Roman Britain. It is popular with hikers and history enthusiasts and it passes through some wonderful landscapes and wonderful, sleepy little villages. It has been a UNESCO World Heritage Site since 1987 and I think it ought to feature on everyone’s travel “bucket list”. 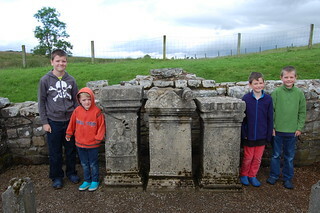 Our first stop of the day was the Temple of Mithras near Carrawburgh. The last time we took the kids there, it was raining, the fields were completely water-logged and the temple was submerged under water. We were glad, therefore, of the opportunity to give them a proper visit. The trio of carved altars at the end of the temple are reproductions but it still provides a clear indication of what the structure would have looked like. The cult of Mithras emphasised valour and honour and as such was popular with Roman soldiers and that means its proximity to Hadrian’s Wall makes complete sense. 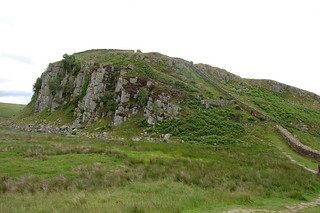 Next stop was just a little further west along the route, at Steel Rigg. This was our first visit to this site and it proved to be a perfect example of the way in which the Wall had been built to conform to the contours of the landscape. 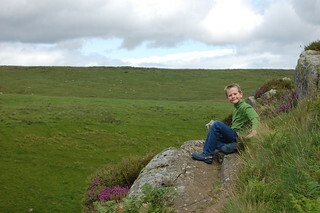 It sloped downwards from hill to valley – where the remains of a milecastle were clearly visible – and then it sharply climbed up a steep and craggy hill. 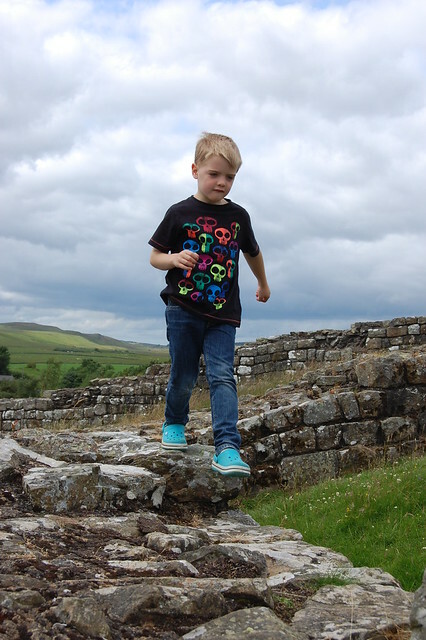 As we walked down the gentle slope towards the milecastle, the littlest Pict took off at high speed on his sturdy little legs and didn’t stop. 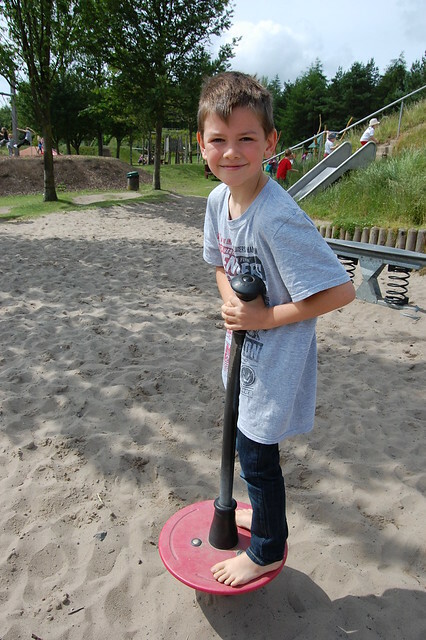 He bounded up the steep, rubbly path as if it was flat ground. 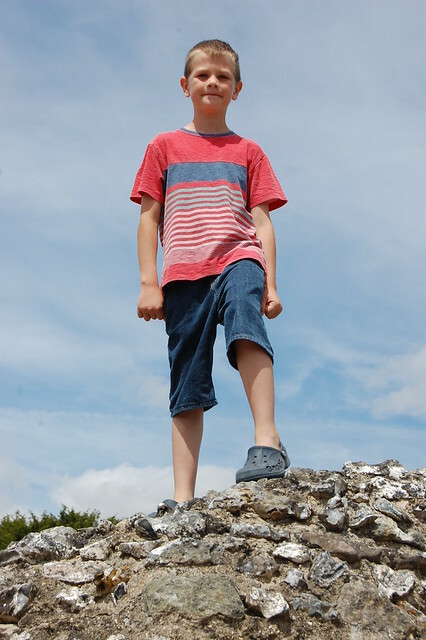 He was nimble as a mountain goat, confident and fearless. 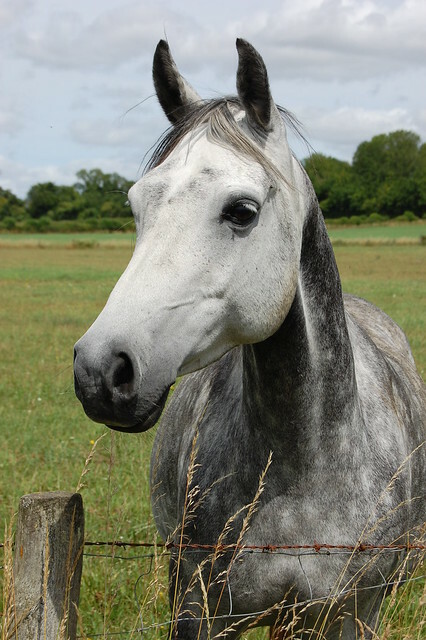 I, on the other hand, was petrified – especially when he galloped past other visitors on the narrow path and was right on the edge. It was also incredibly blustery and the strong winds did not help me feel secure on my feet as we ascended. The view from the top was spectacular as it was possible to see the Wall stretching off into the green horizon in both directions. If ascending had been nerve-wracking, descending was even worse. The wind had picked up even more plus the perspective looking down at drops onto crags and boulders rather than facing into the rocky path was really amping up my acrophobia. My boys meanwhile were leaping from rock to rock, practically pirouetting on the edge of the path, bounding down the narrow path, and were making my knees quake. Our last stop on that visit to Hadrian’s Wall was the stretch that is near Cawfields Quarry, which we have visited before. 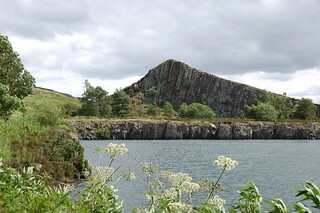 The quarry itself is rather picturesque, a massive triangle of rock rising above the quarry which is filled with water. The boys spent some time watching birds floating around on its surface. However, the quarry cuts right through the wall which is visually dramatic but archaeologically devastating. 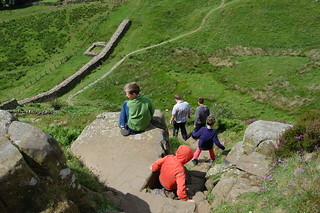 The three younger Pictlings and I headed along the path to checkout the milecastle, one of the best preserved along the entire Wall. 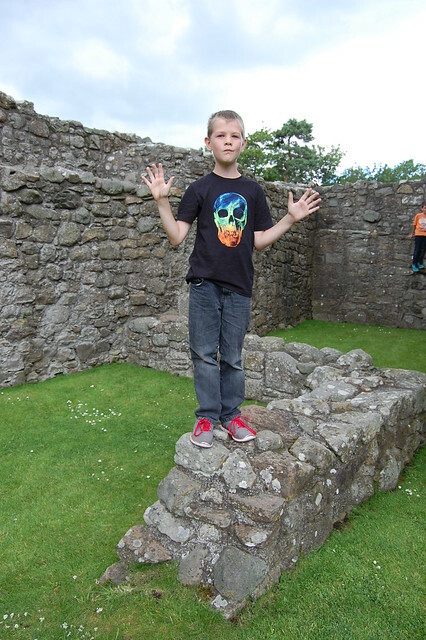 The walls of the milecastle as well as Hadrian’s Wall itself are really thick at this point so my kids had fun climbing over the walls and pretending to be Roman soldiers guarding the fort. 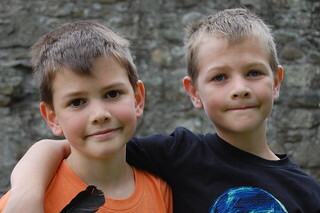 We would have loved to have crammed in a few more spots on Hadrian’s Wall but it was mid-afternoon when we finished our exploration at Cawfields and we had not even had breakfast yet. We also had a long journey ahead of us still as we had to get to Wiltshire at the other end of England. 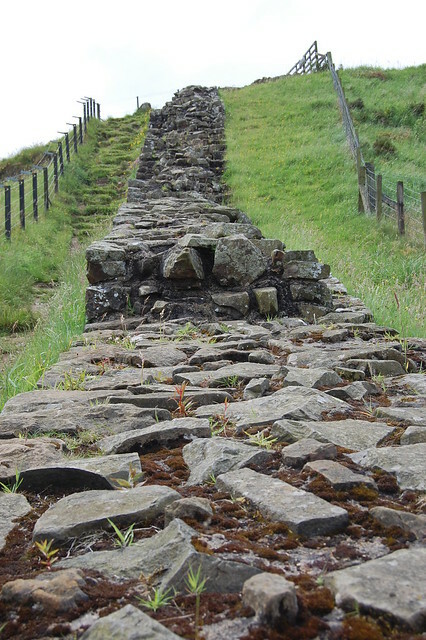 I have no doubt, however, that we will return to Hadrian’s Wall again some time. 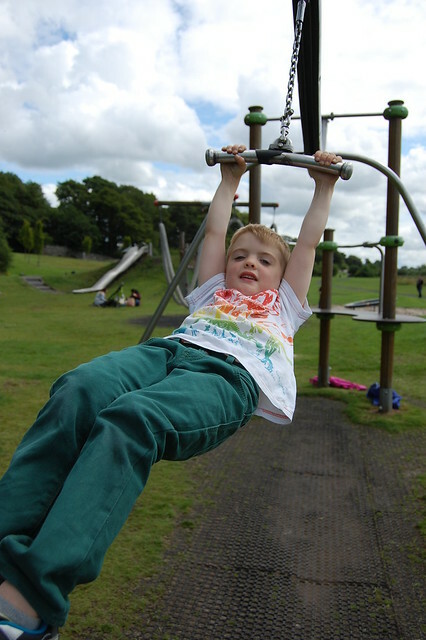 Lochore Meadows Country Park, in Lochgelly, Fife, is on the site of a former colliery. What was once an expanse of industrial waste and coal bing hillocks was transformed into an outdoor space for people to enjoy. 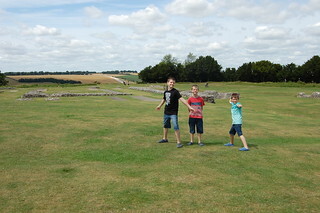 Knowing that we had a long car journey ahead of us the following day that would keep us all cooped up, it was the perfect venue for letting the boys roam free and burn off some energy. 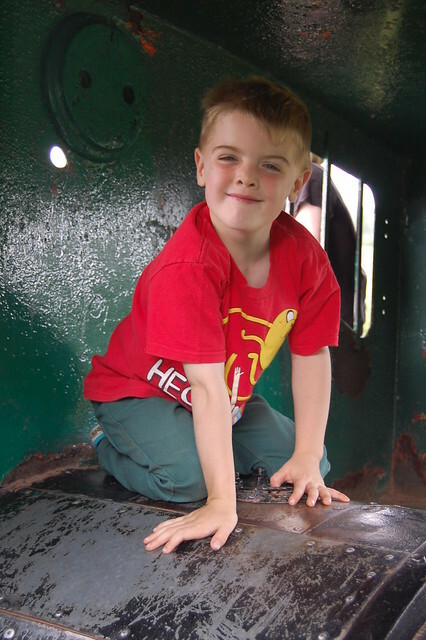 The playground is arranged around a series of mounds, echoing the coal bings I imagine, so there was lots to explore, loads to do, and plenty of fun to be had. 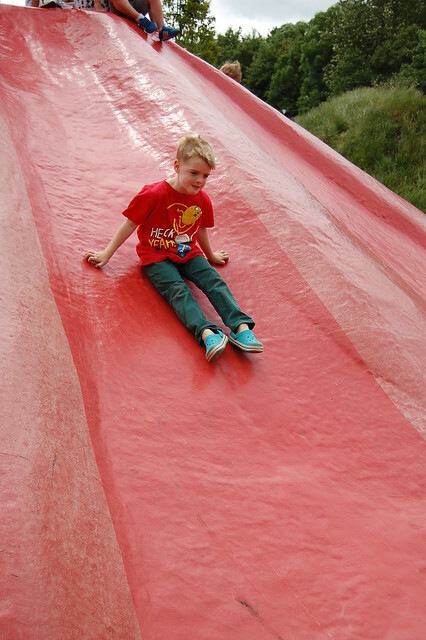 The boys were especially impressed with the slides because they were long, steep and very slidey indeed. 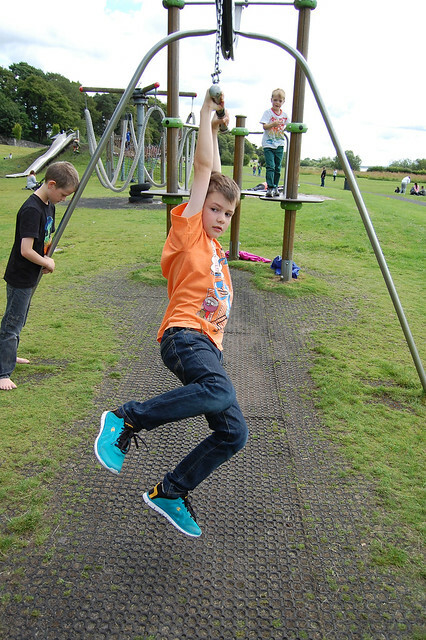 There were climbing frames that looked reminiscent of mining structures, swings and spinning discs that made the kids dizzy. 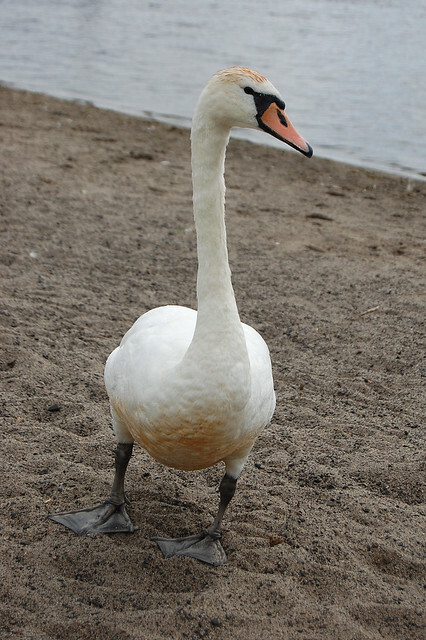 There was a gritty beach around the shore of Loch Ore – which is used for water sports – and the beach was populated by some moody looking swans. Their poop was all over the shoreline which just added to my loathing of sandy beaches. 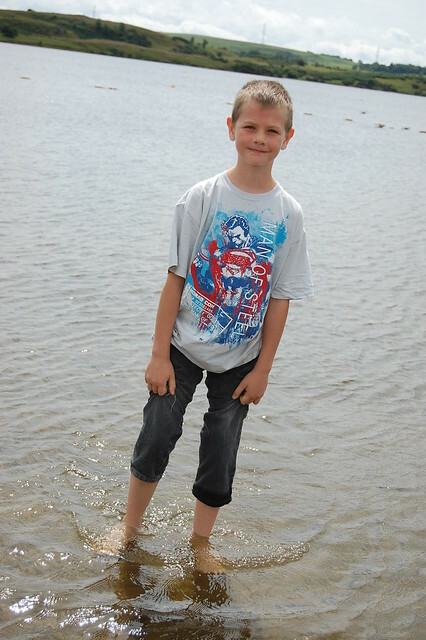 Nevertheless, my 9 year old decided to go paddling and ended up having soaking wet jeans for the rest of the day. At least nobody was attacked by a grumpy swan, however, so there’s that. 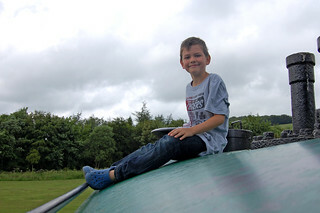 Having exhausted the playground, we wandered over to the area of the park that still has a tangible connection to the site’s coal mining past. 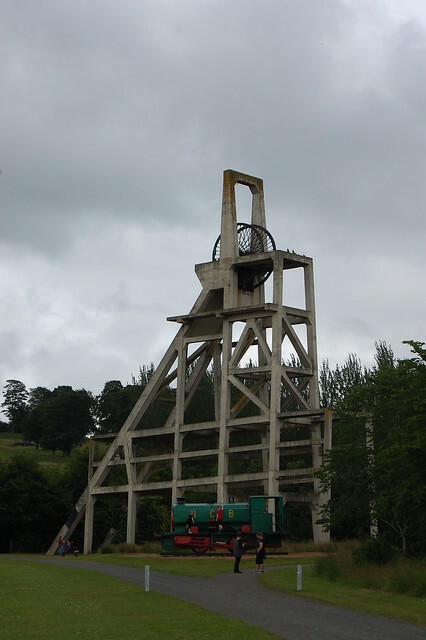 A large concrete headframe with its winding gear looms over the horizon. Two of my sons immediately asked if they could climb it. Thankfully that is not remotely possible so I didn’t even have to put my foot down on the basis of safety. 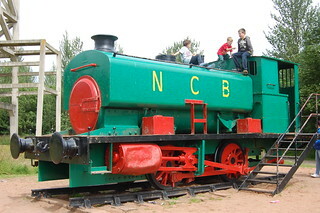 However, at the base of the headframe is a locomotive engine. 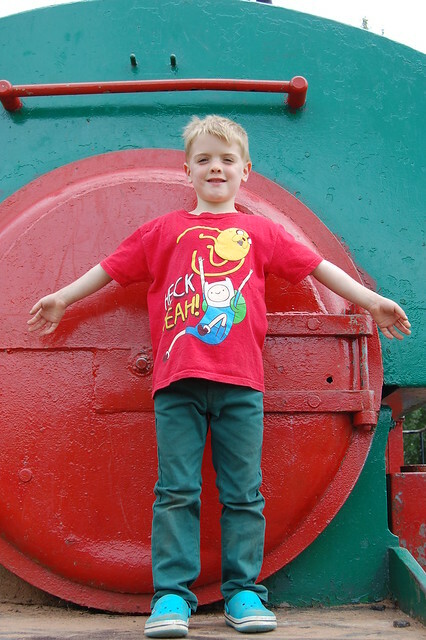 It would once have been used to transport coal from the mine but now was a combined piece of local industrial history and a fun climbing frame. 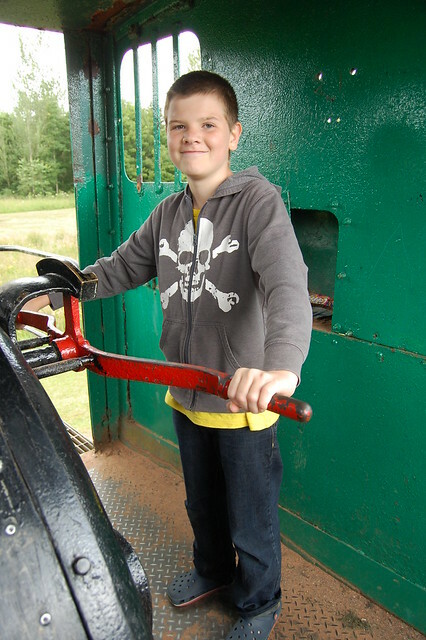 The kids immediately started scaling the engine and were soon crawling all over it. They had a whale of a time. 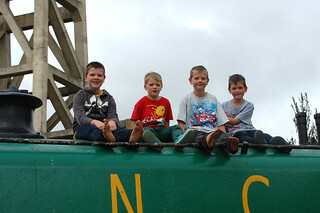 The locomotive was definitely the highlight of the day for them. 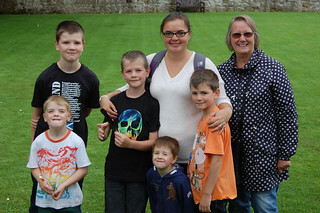 My boys and I took a trip to Loch Leven Castle accompanied by my mother, one of my sisters and her youngest son. 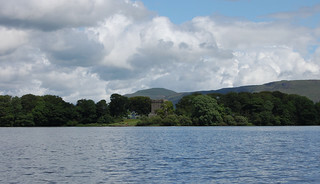 A trip to Loch Leven Castle necessitates taking a boat to cross the loch and, as there were eight of us, we were told that our group would have to wait for the 1pm crossing. 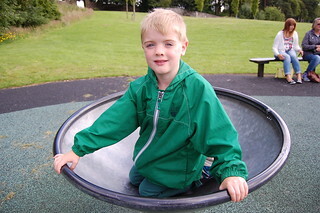 This presented us with no problem since there is a fantastic playground on the mainland side of the loch. 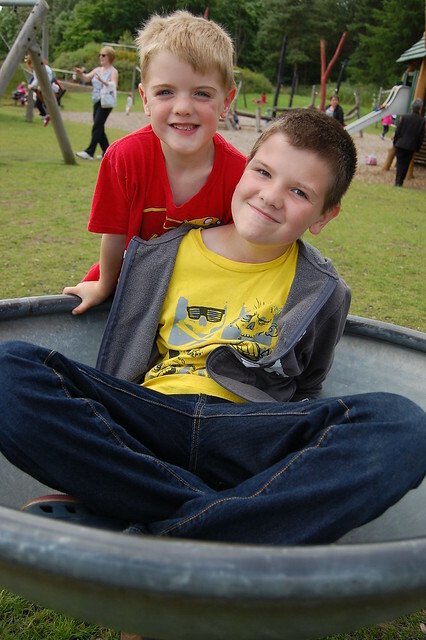 The kids had a great time careering up scramble nets and across rope bridges, whipping across zip slides and careering down slides. 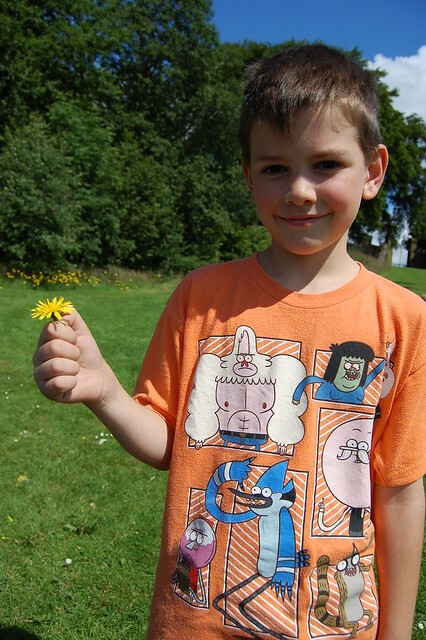 As it seemed apt to do so, I also taught the kids how to do “Mary Queen of Scots got her head chopped off” whereby a flick of the thumb is used to knock the head off a dandelion. In no time at all, it was time to go to the jetty and clamber aboard the small boat that took us across the loch to the island. 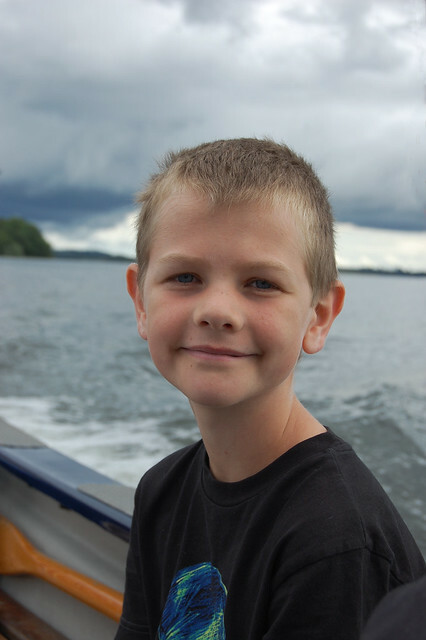 The boat ride was part of the whole experience for the kids rather than just a necessity as they loved being out on the water. In just a few short minutes we reached the island and were deposited on the shore. 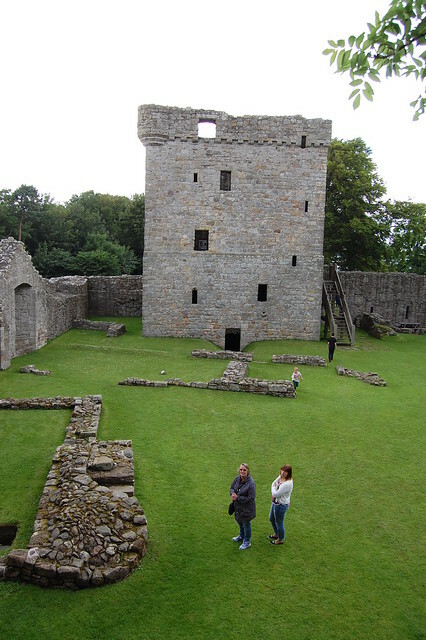 Loch Leven Castle has a rather sad and sorry story, involved as it was in so much conflict and tragedy. 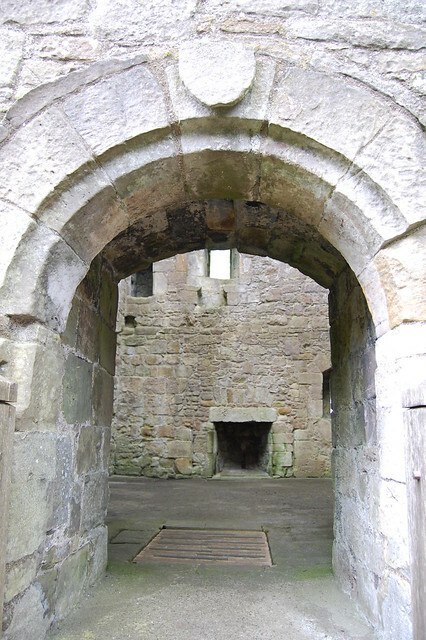 It was built some time in the 13th Century and went through a period of being captured by the English and then recaptured by the Scots and then retaken by the English and taken by the Scots again … The story of Scottish medieval history really. 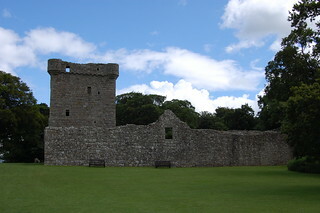 The prominent keep dates from the 14th Century and was frequently used as a prison. Some notable prisoners died in captivity there. The most famous of Loch Leven’s prisoners, of course, was Mary Queen of Scots. 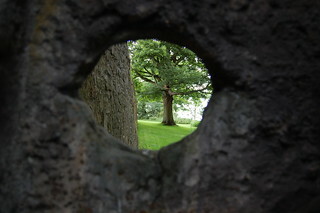 The story of her imprisonment and escape are the Castle’s main claim to fame. 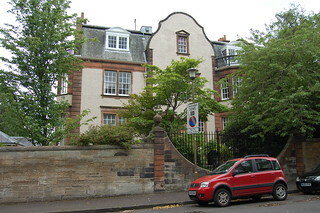 Scottish nobles, opposed to Mary’s marriage to the Earl of Bothwell, placed here there in 1657 under a form of house arrest, a sort of awkward guest of the Douglas family who owned the property. A few days after she miscarried twins, she was forced to abdicate thus making her baby son James the King. Under a year after she was imprisoned, however, Mary – aided by a member of the Douglas family – was able to make her escape, row across the water and flee to freedom. 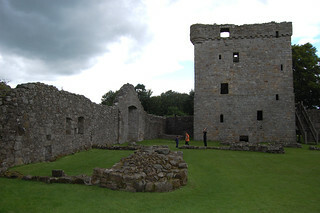 The Castle changed hands several times and fell into ruin by the 18th Century. That, however, is my kids’ favourite kind of castle. They much prefer to run around and explore the empty spaces than to see historic buildings with restored and recreated rooms full of furniture, tapestries and treasures. 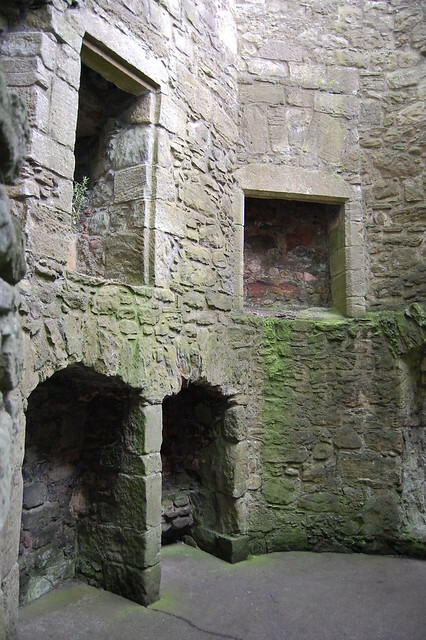 The keep – or tower house – was originally five storeys. Access has greatly improved in terms of safety since I last visited. 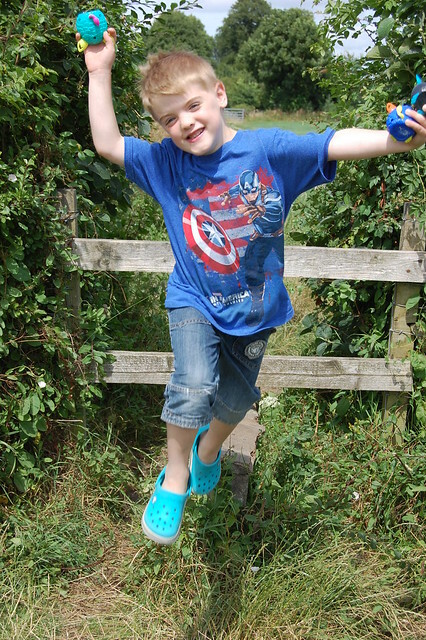 I felt completely at ease allowing my boys and my nephew to run in and around the keep unaccompanied. 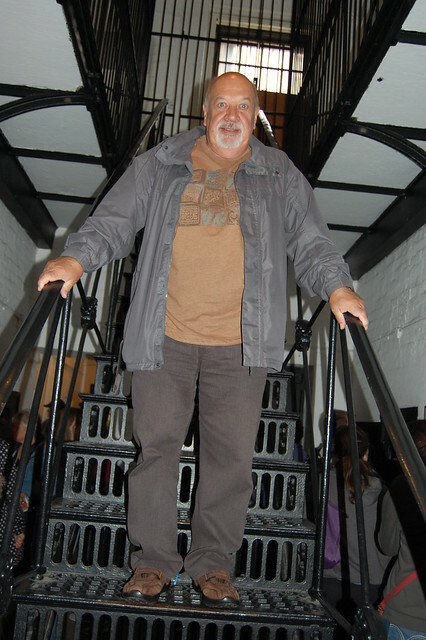 They could enter through one exterior door, ascend staircases inside and then emerge onto an external wooden staircase from a door part way up the tower – and they did so again and again. They also enjoyed running in and out of the Glassin tower, a round shaped tower of rooms in the opposite corner, and scaling the ruined walls. 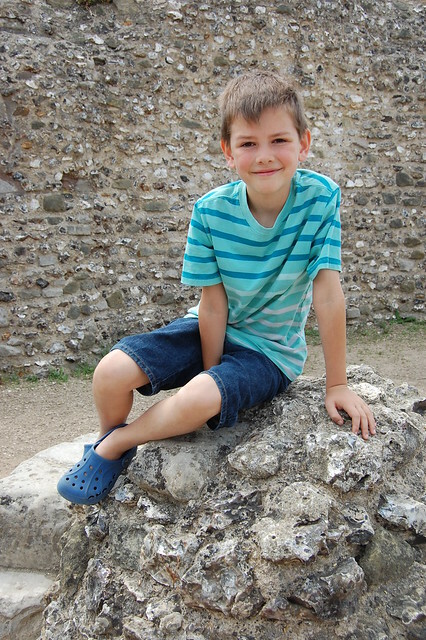 We spent much longer on the island than our fellow visitors as the five boys were having a whale of a time playing in the ruined buildings and running around in the courtyard. 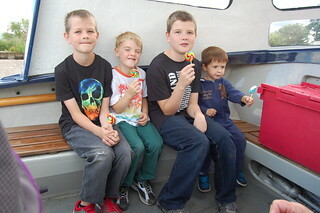 Thankfully they had the boat ride back to look forward to and a trip to the sweet shop for a wee treat each otherwise we might never have got them to leave. 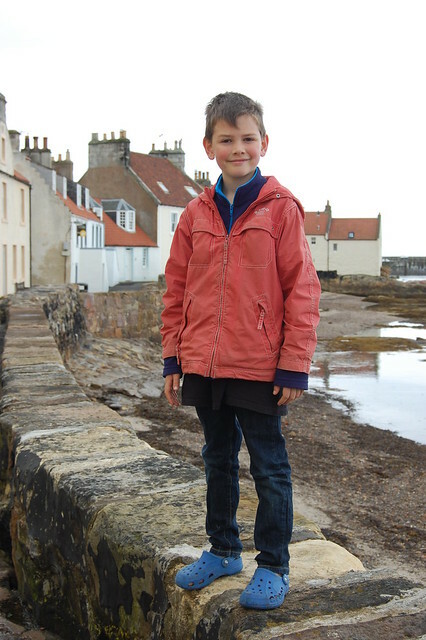 Fife* is a peninsula, bounded as it is by the Firth of Tay to the north and Firth of Forth to the South. 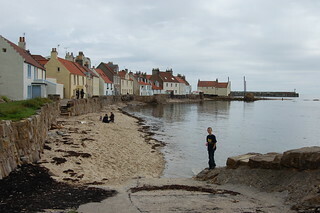 Its coastline, therefore, has always been important to its culture and economy, from the docks at Rosyth and around the East Neuk. 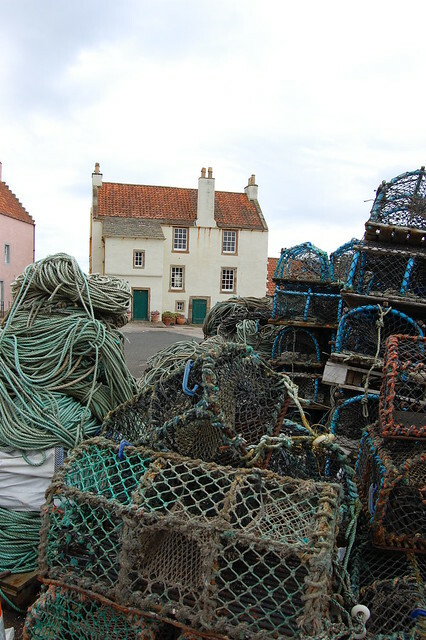 I wanted to take the boys to see a typical East Neuk fishing village and plumped for Pittenween, situated between St Monans and Anstruther, since it still has a working fishing harbour. I went with my four boys, my mother and two of my nephews. 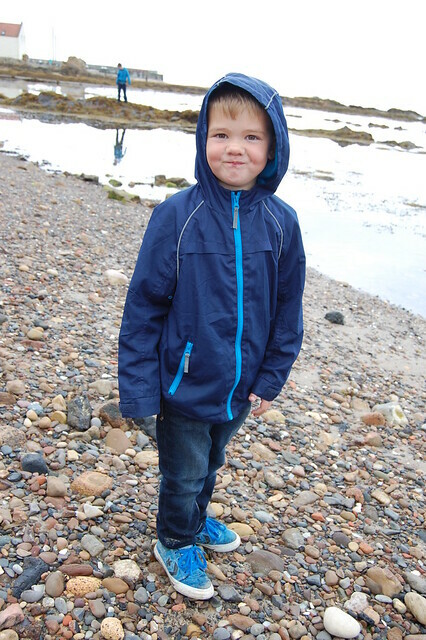 We parked up on the West Braes and, after the six kids had all run off some energy on the playground equipment there, we wandered down a coastal path to the shore line. That vantage point gave us the perfect view over the village. 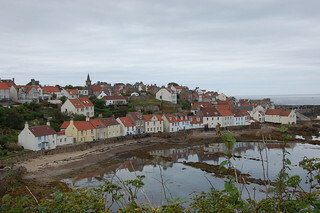 I was able to point out to the boys the way in which the village was all clustered around the harbour and shoreline with other streets – narrow wynds – running up the hill from the coast. They were also able to see the traditional architecture: white stone houses with red tile roofs. The red pantiles are a legacy from the its history of trade with ships from the Low Countries. I remember being told that the pantiles would have been brought as ballast in the hulls of those ships and that the locals then put them to good use in their buildings. 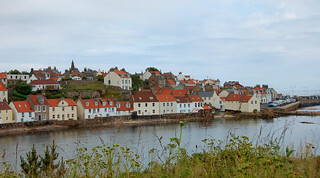 The buildings certainly makes the town very distinctive and the only Fife town I can think of that is more quaintly historic is Culross**. It mattered not one jot to the kids that it was a chilly, overcast day. There was a beach and they were going to play on it. 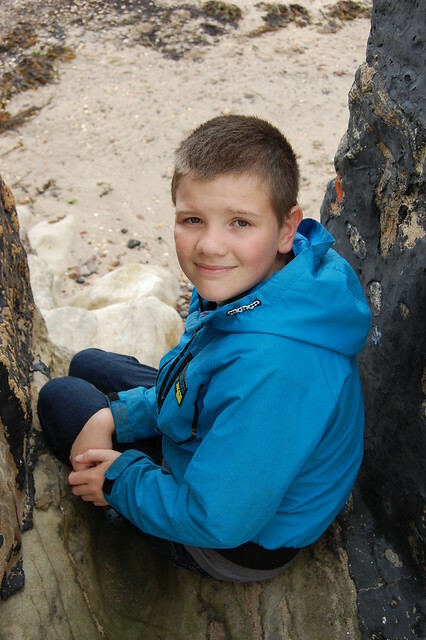 While my 12 year old – having the advantage of longer legs – rolled up his jeans and waded out into the water, the other boys got busy studying shells and soon I got them collecting sea glass. 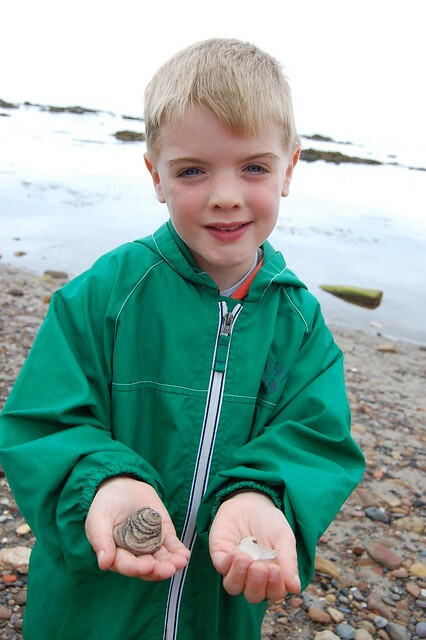 I was obsessed with collecting sea glass from the Fife coast when I was wee. Clear was common followed by green and brown but it was like finding treasure to find a piece that was either blue or red. 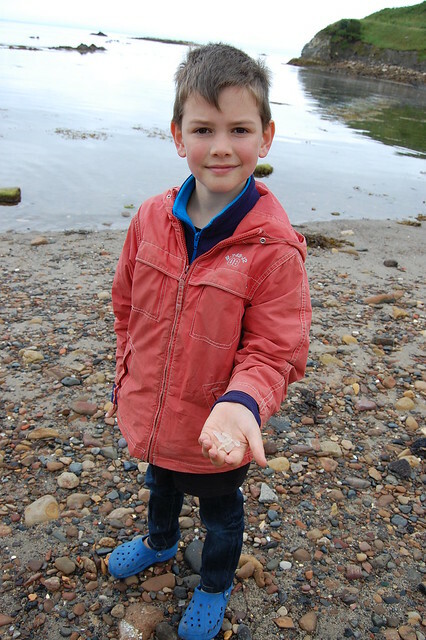 Soon enough, all the boys were similarly obsessed with a mission to find interesting pieces of sea glass or sea pottery and they too would squeal with delight when they found a tiny piece that was a shade of blue or a sliver of red. We then walked through the village. We stopped opposite the harbour in order for the boys to have an ice cream cone each. 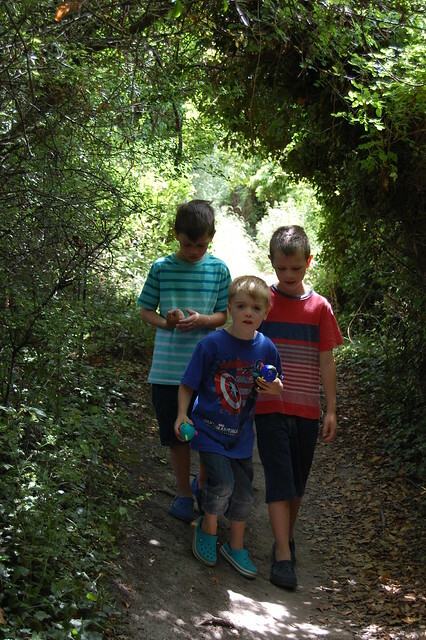 That village sweet shop did well out of us as I gave the six boys a pound each with which to buy treats on the way back too – doubling as an exercise in making budgeting decisions and addition. 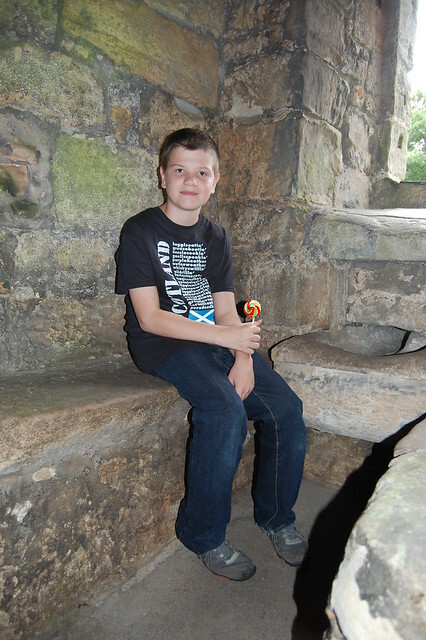 Replenished by the ice cream, we then climbed up a steep wynd in order to reach the High Street. There I popped into the Cocoa Tree coffee shop to borrow the key to St Fillan’s Cave. 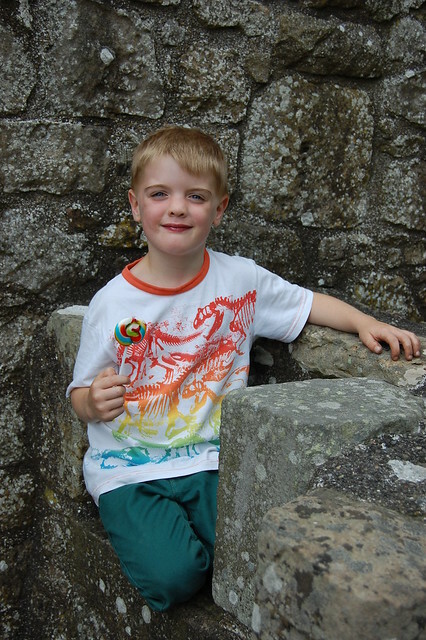 In all my years of living in Fife and returning to visit my family, I had never once been to St Fillan’s Cave so it was a new experience for all of us. Just a brief wander down Cove Wynd brought us to the cave. 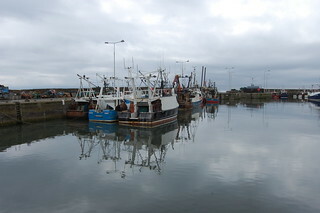 The place name Pittenweem, by combining Pictish and Gaelic, actual means “place of the caves”, probably referring to St Fillan’s Cave rather than any other caves in the vicinity. Local schoolchildren had decorated the exterior with a mosaic using materials from the beach and a local metalworker had made a fantastic gate. Unlocking the gate, we entered, flicked on the lights and walked into the cavern. 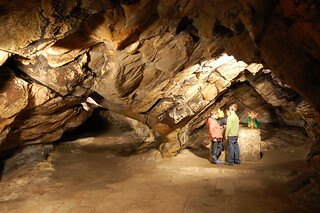 As its name suggests, the cave is associated with St Fillan. 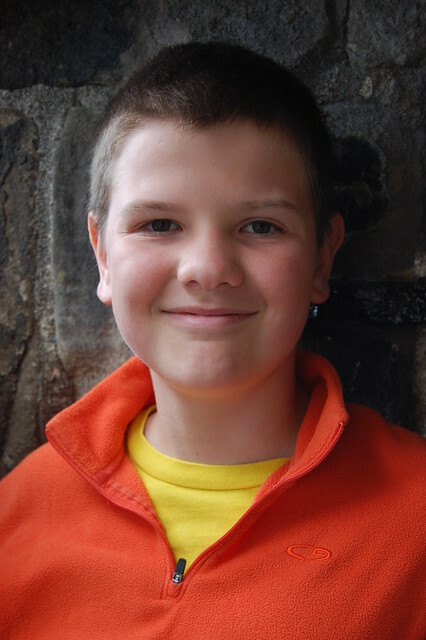 The legend goes that Fillan was a 7th Century missionary who came to Fife to convert the Picts to Christianity. He lived in the cave and could read and write in the dark because his left arm was luminous. The cave was probably used by spiritual hermits and was a place where pilgrims could stop in and visit en route to St Andrews. It was also used as a store for smuggling and for legitimate fishing equipment. 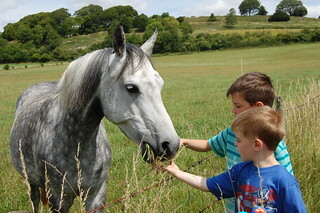 Apparently it was then forgotten about for many years until a horse, ploughing the land above, fell through a hole. The cave was then cleared and turned into a chapel again, used for occasional services. 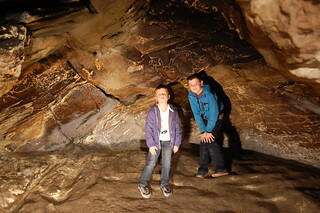 The boys loved exploring all of the nooks and crannies of the cave and I let them experience the pitch dark by gathering them safely in the centre and then switching off the lights. Without the benefit of luminous arms, they soon wanted the lights back on. 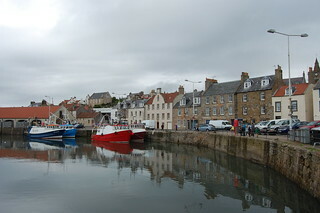 We then wandered down to the harbour to watch the boats and just enjoy the peace and quiet. 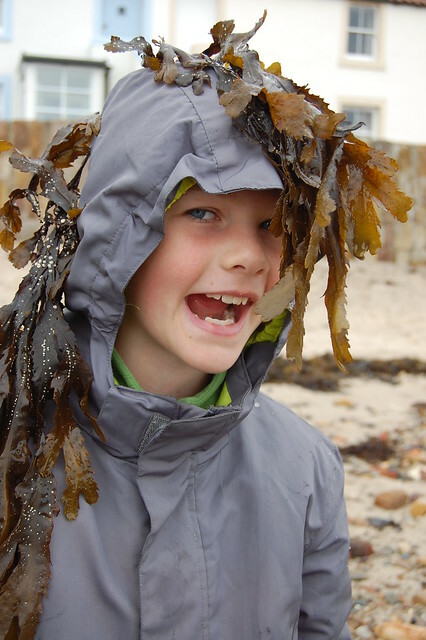 We then wended our way back towards the beach, where the tide had come back in to the consternation of the kids, and back up to the Brae for the kids to have another run around as a conclusion to our trip. *Or the Kingdom of Fife as it is still known in reference to it being a Pictish realm, hence the title of this blog since I am a Fifer. 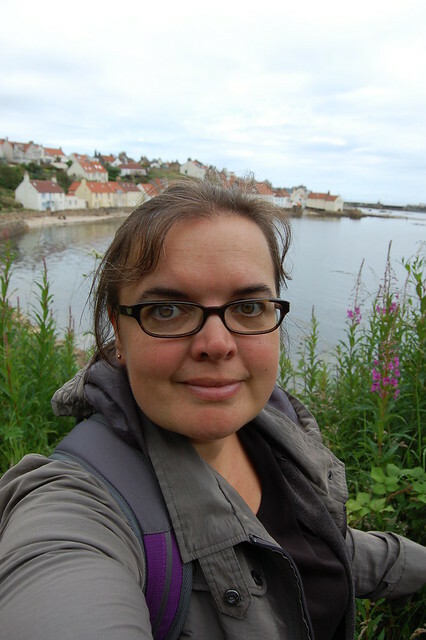 ** We unfortunately did not have time to visit Culross on this particular trip to Britain but I heartily recommend visiting. Well I could not have planned the timing of this blog post better if I had tried. 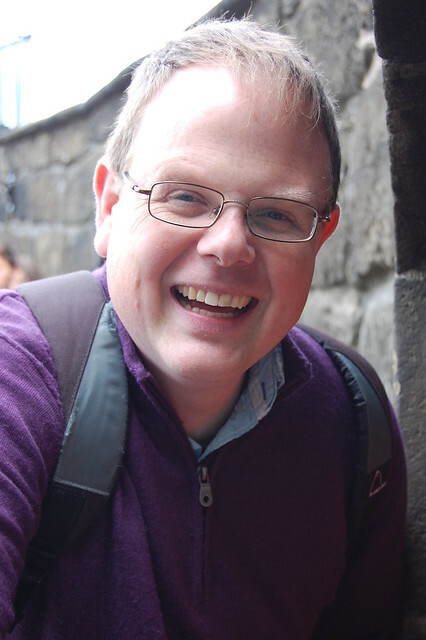 I am just battering out blog posts about our trip back to Britain as and when a quiet moment arises between chores and entertaining / refereeing the kids yet by happy coincidence the subject matter and timing of this post happily coincide: exactly 19 years ago today, Mr Pict and I got married in Edinburgh; this blog post is all about the tour down memory lane that we dragged our kids on as part of our day in Edinburgh. First up on our nostalgia tour of the day was the street where we got married all those years ago. We had a civil ceremony in what was the city’s registry office on Victoria Street. Sadly India Buildings has been disused for over a decade and is awaiting some sort of development. 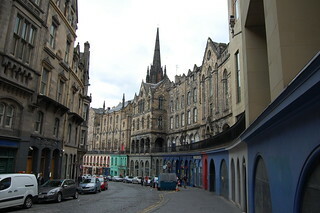 Victoria Street, however, barely seemed to have changed from when we lived in Edinburgh. I have always loved Victoria Street for its elegant curve and its stacked architectural design, colourful shop fronts with arches below and more impressive buildings on the terrace above. Here is a photo of Mr Pict and me outside India Buildings with our four sons and my youngest nephew. 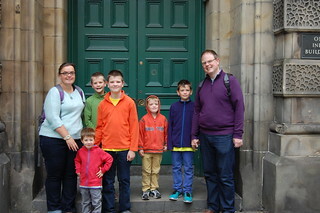 We wanted to take the kids to see the buildings at the University of Edinburgh’s main site where we had studied for our undergraduate degrees. The whole area, however, is undergoing something of a radical transformation it seems and we could not see past construction hoarding. The kids had to make do with seeing some of the less impressive buildings and listening to our tales. From Potterow, they could just make out the shape of McEwan Hall – covered in a web of scaffolding – where we had graduated from our first degrees almost two decades ago. 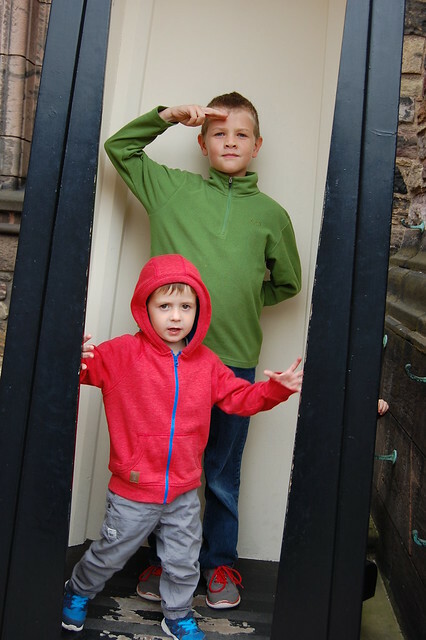 Having been disappointed by our ability to tour the main campus, we took the boys to see the wonderful Old College. 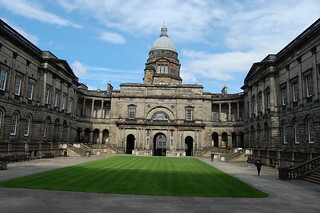 The buildings around the quadrangle of Old College were designed by three of Scotland’s most famous architects – Robert Adam, William Henry Playfair and Robert Rowand Anderson, who was responsible for the dome – and the architecture certainly impresses. 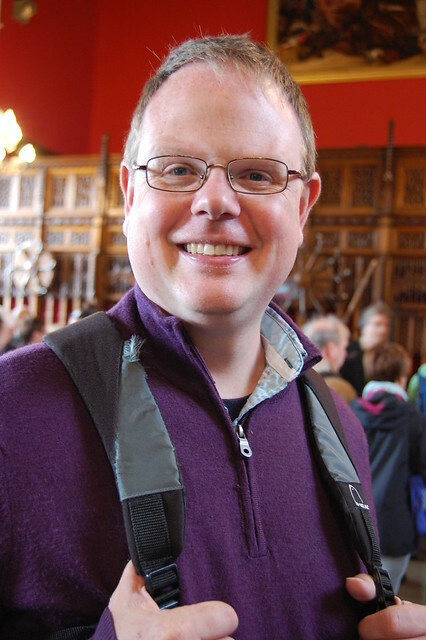 The University’s School of Law is housed in Old College and Mr Pict undertook studies there in his first year. I was familiar with Old College because of admin services being situated there and also from visiting the Talbot Rice Gallery. It was always a lovely, quiet, restful spot. 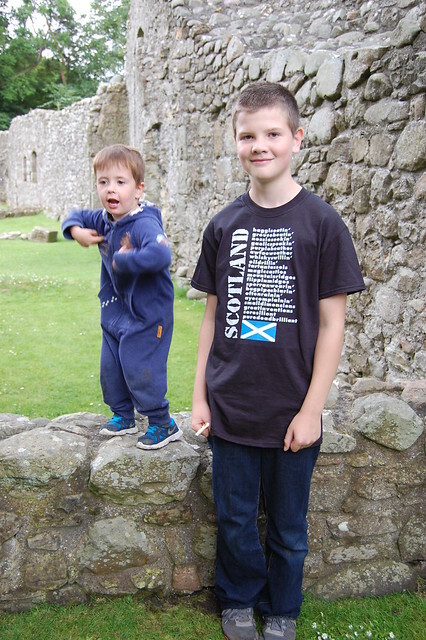 The final leg in our Recent Family History Travel Through Time was to take the boys to Where It All Began. Mr Pict and I first met because we happened to be billeted in the same student accommodation for the first year of our studies. It was a converted house on a residential street in a rather nice part of the city and the sixty of us accommodated there were actually the last to be so. The summer that we all moved on to pastures new, the property was sold off and reverted to being a private residential property once more. In the photo below, the window in the grey tiled roof on the left hand side of the image was the window to my bedroom. 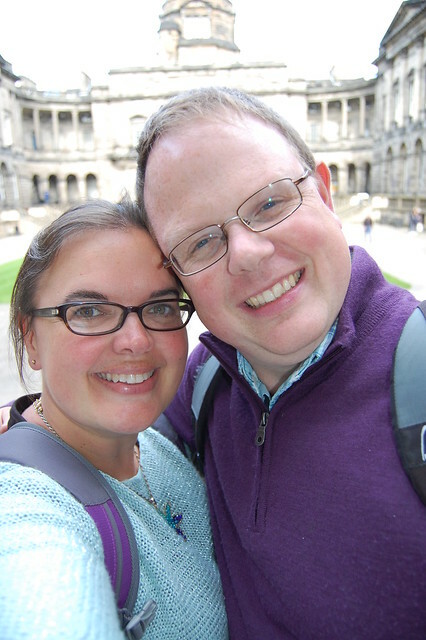 So 19 years after we got hitched, almost 22 since we first met, that was our little Personal History Trip around Edinburgh with the kids. I wonder what we will be up to next year for our 20th Wedding Anniversary?!?! 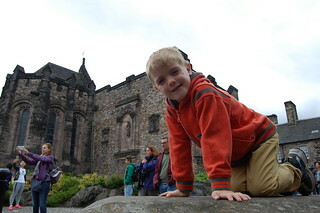 The focus of our day trip to Edinburgh was to visit the Castle. 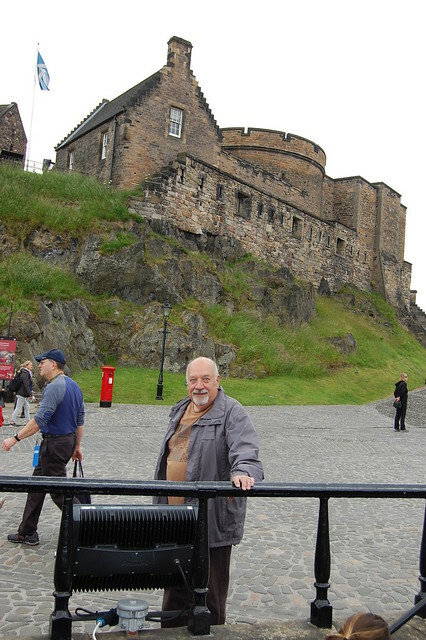 I had not been to Edinburgh Castle for almost 20 years, bizarrely Mr Pict had never been despite us living in the city centre for five years and – obviously – none of the Pictlings had ever been. 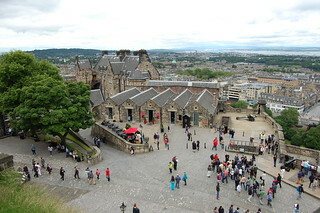 Edinburgh Castle is very distinctive, a large fortress sitting atop an extinct volcano. 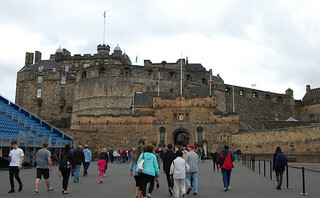 There has been some sort of castle on that site since at least the 12th Century and it has, therefore, evolved over a lengthy span of history, gradually transitioning from being a royal residence to being a military barracks. 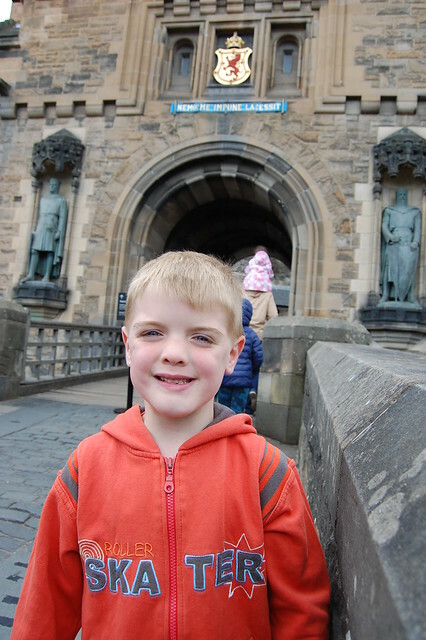 The kids instantly found Edinburgh Castle to be enchanting because it is just the type of castle children conjure up in their imaginations. 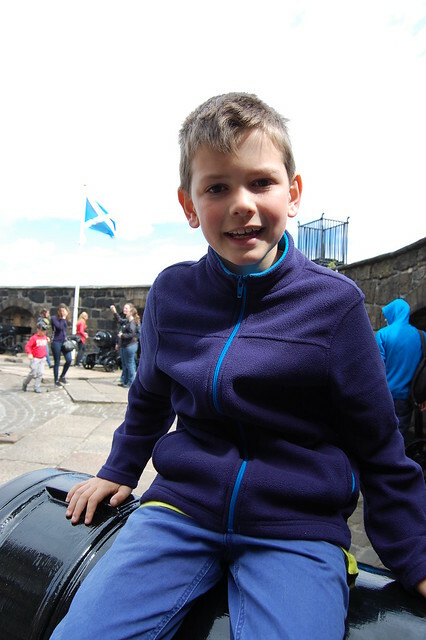 From walking through the thick outer walls beneath a portcullis, to walking the battlements, to clambering up cobbled paths and exploring murky dungeons, there was plenty to spark their interest. 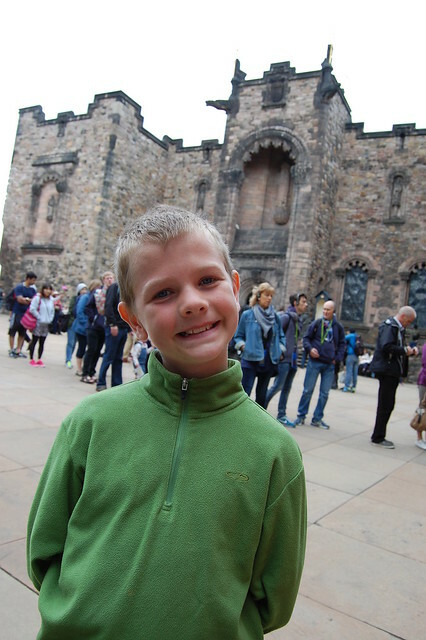 We decided, however, that a tour of castle highlights would be best rather than slogging around every section of the site and risk the kids disengaging. 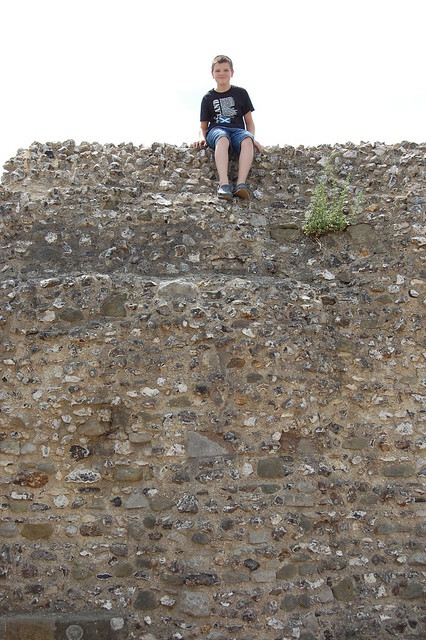 We all enjoyed perusing the view from the castle ramparts. 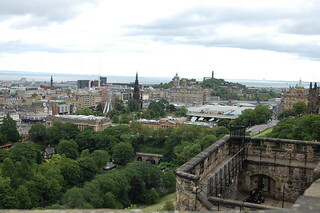 We had clear views over Princes Street Gardens, the New Town and the West End, the Mound, Waverley Station and all the way across to Calton Hill. 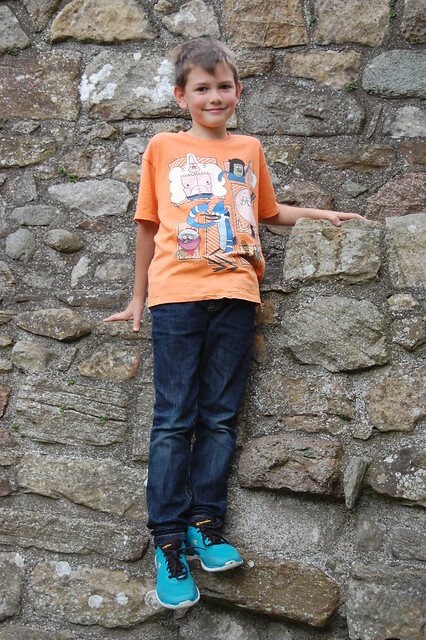 While the adults reminisced about the places we could see, the boys enjoyed clambering onto the many canon. 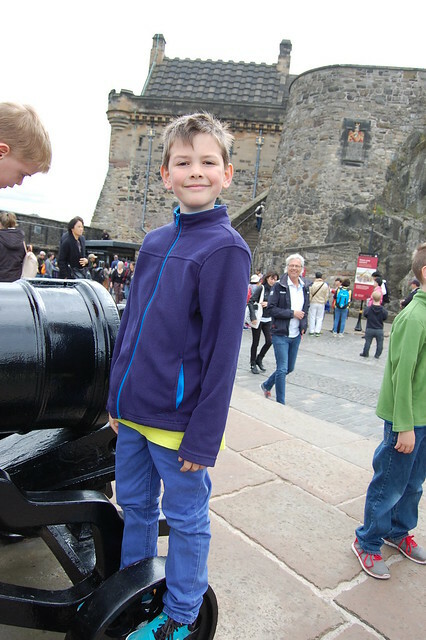 On the subject of canon, the kids were able to see the famous one o’clock gun. It has been firing since 1861, a way for ships in the Forth to gain an accurate time for setting their clocks by, and the tradition has continued long past its maritime relevance. 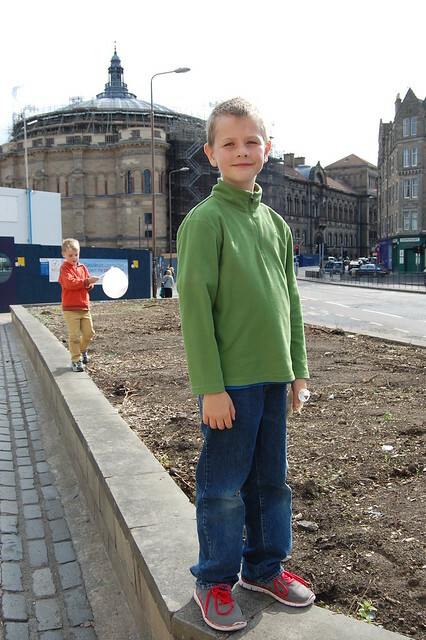 I used to love listening for it when I was wee and was visiting my Gran and it was always entertaining to see visitors to the city, not aware of the tradition, give a startled jump when it banged. We were in the Castle at one o’clock but sadly it was a Sunday and the gun is silent on Sundays and other pertinent days throughout the year. 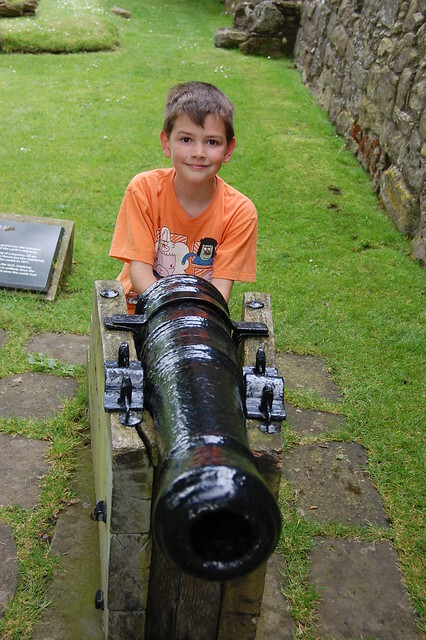 The other famous canon within the castle walls is much older: Mons Meg. 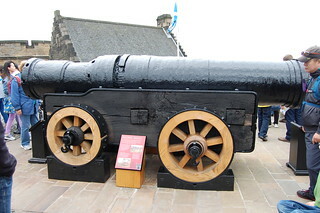 Mons Meg is a medieval canon and apparently has the largest calibre of any canon in the world. 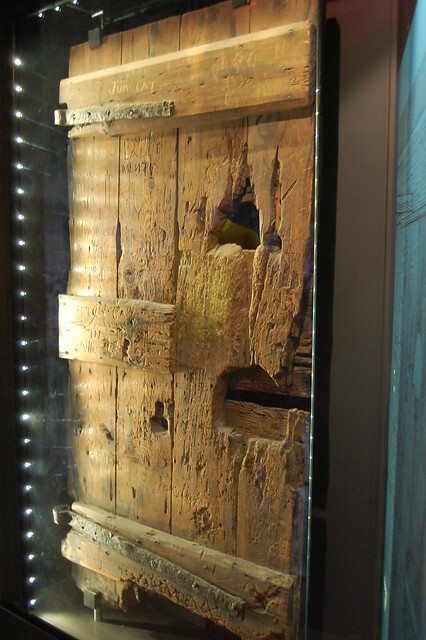 It suffered an injury in the late 17th Century and has just been on display ever since. Nowadays Mons Meg is famous for its role in Hogmany celebrations as it is fired at the beginning of the fireworks display, an indication of the passing of the old year into the new year. 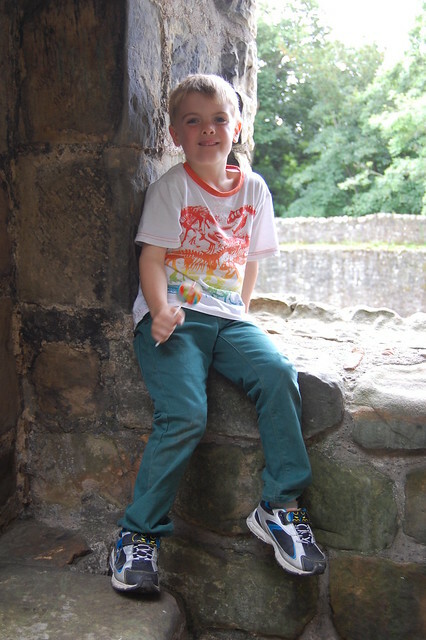 We spent a great deal of time on the Citadel, the upper level of the castle accessed via the arched Foog’s Gate. 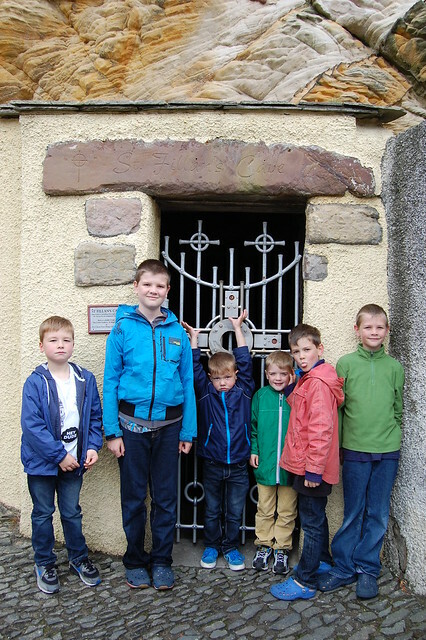 There we visited St Margaret’s Chapel, a tiny building believed to be the oldest building still extant in Edinburgh. Margaret, a Wessex princess and the wife of Malcolm III of Scotland, was renowned for her piousness and good deeds. Margaret did not actually worship in the chapel. It was built in the reign of her son David, in the 12th Century. 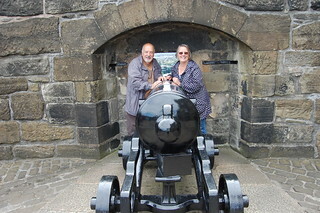 We also enjoyed the panoramic views from Half Moon Battery which took in such places as the Salisbury Crags and Arthur’s Seat and the area of Edinburgh where Mr Pict and I had once lived. We joined the line to view the Honours of Scotland which was effectively a conveyer belt of people. The line was in constant motion and it was absolutely necessary to keep pace with those in front and behind or else risk getting completely snaggled up. The system was a plus in that it removed the tedium of queuing. The lines snaked through displays and dioramas depicting the history of Scotland’s crown jewels, from their manufacture by skilled artisans to their use in royal ceremony through to their disappearance and rediscovery by the novelist Sir Walter Scott. After about 20 minutes we finally ended up in the room where the actual Honours – a crown, sceptre and sword – were showcased alongside the Stone of Destiny, a block of sandstone once used in the coronation of monarchs and the object of much conflict and controversy between Scotland and England. We then segued into the rest of the Royal Palace in order to see the apartments where Mary Queen of Scots gave birth to James VI and I in 1566. 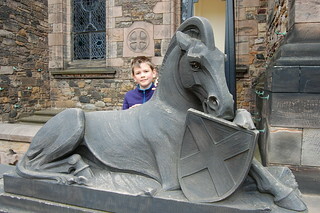 As the chap who united the thrones of Scotland and England, I thought it might be handy for the boys to have that connection to his personal history to act almost as a mnemonic for his role in history. I also knew we were going to be visiting another Mary Queen of Scots site so I wanted them to be considering her importance to Scottish history too. 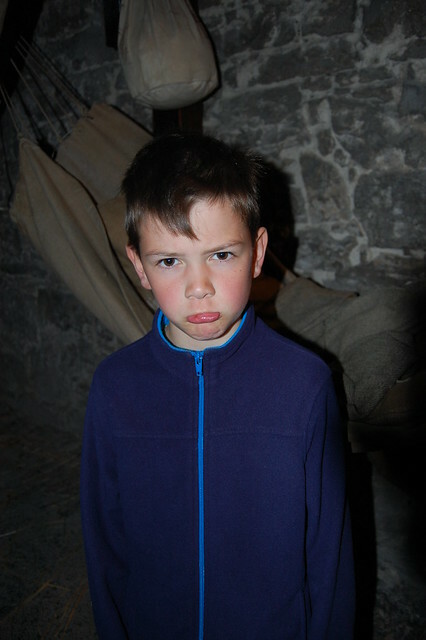 Sadly, all but the oldest found the rooms dull so I think that was an education fail. 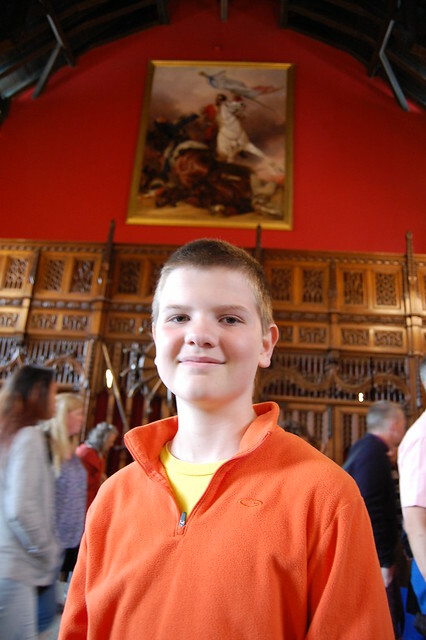 Much more impressive to the kids was the Great Hall, a spacious Renaissance room with a hammerbeam roof. It was converted into barracks during the Commonwealth with floors being added to split it into three storeys and then became a military hospital before being restored at the close of the 19th Century. 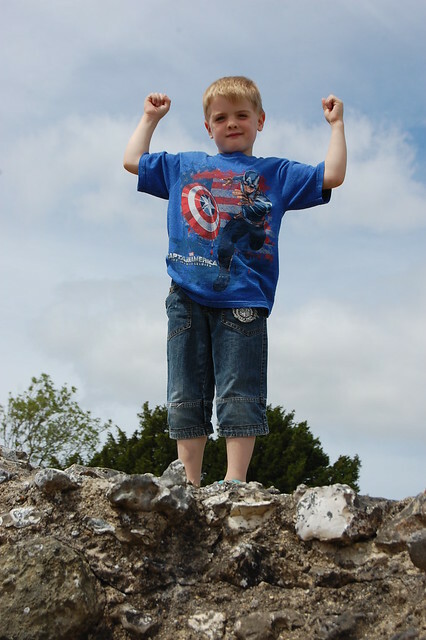 What the boys loved about it was that the walls were lined with hundreds of swords and other pointy weapons and there were suits of armour throughout too. Along with the huge stone fireplace, it made them think of the hall at Hogwarts School. My Dad and I then had a wander into the Scottish National War Memorial which commemorates those killed in the two World Wars and more recent conflicts and houses the Rolls of Honour. Next up were two prisons. The first we visited was the Victorian military prison, a collection of spartan cells, a basic shower room and a room for ablutions. 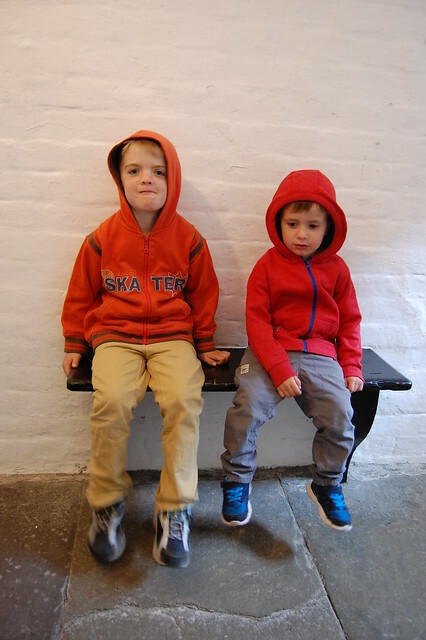 The boys all enjoyed pretending to be prisoners while their granddad was the prison warden. The kids learned about the type of offences that would have led to soldiers being sent to the cells and the types of repetitive or physically exhausting punishments they would be given. I was hoping their might be a moral in the tale. We then went to see the vaults where prisoners of war were once housed. These were dank and dark with hammocks hanging everywhere. 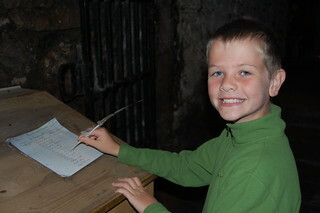 The standard conditions had been recreated to bring the scene to life so the children were able to comprehend what life would have been like there for the prisoners – from America, France, Spain and Holland – cooped up together, keeping themselves entertained by crafting, eating food the kids would find ghastly. They were shocked to learn that the prisoners would have included cabin boys, some as young as six years old. We also saw the prison’s original wooden doors which were covered in carved graffiti. 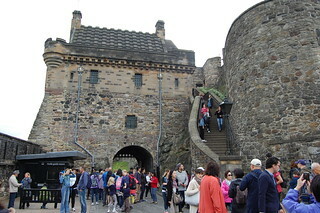 The prisons were our last stop on our jaunt around Edinburgh Castle. Sans kiddliwinks it would be easy to spend at least a couple more hours touring the buildings and absorbing the history. 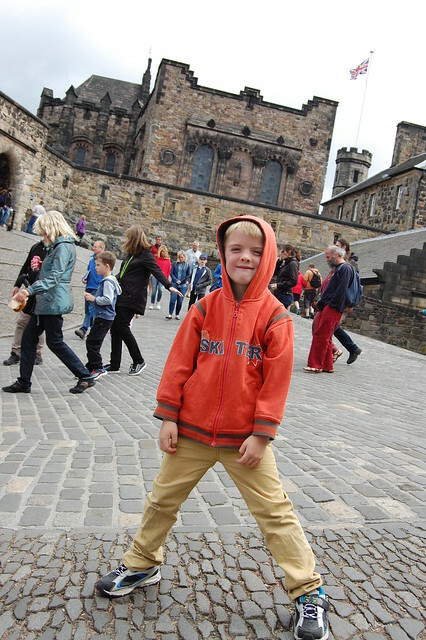 There are just so many layers of history at Edinburgh Castle and we barely skimmed the surface.